The «AT-X» in the series name stands for «Advanced Technology-X», to express the advanced performances and specs of its lenses. A well-built exterior and the «one-touch» focus clutch mechanism assure ergonomic and pleasant operations. The new AF «GMR magnetic precision» control sensor is capable offastauto-focus. Tokina placed the new sensor closerto the drive unit in the lens for faster communicationbetween the controller and AF motor. This combined with the motor’s high-precision focus control yields faster, more accurate auto-focus. Additionally, a brand new «SD-M» (Silent Drive-Module) has greatly lowered the sounds emitted by the auto focusdrive system allowing for much quieter AF. Both Canon and Nikon mounts have a built-in AF motor to make them auto-focus compatible with all current camera bodies. The Tokina AT-X 12-28 PRO DX compact design makes the lens easy to carry and handle. Manual focus is achieved through Tokina’s one-touch focus clutch AF/MF mechanism. Simply slide the manual focus ring forward for auto-focus or back for manual focus operation. The lens focus ringis damped in the manual mode for smooth and precise focusing. 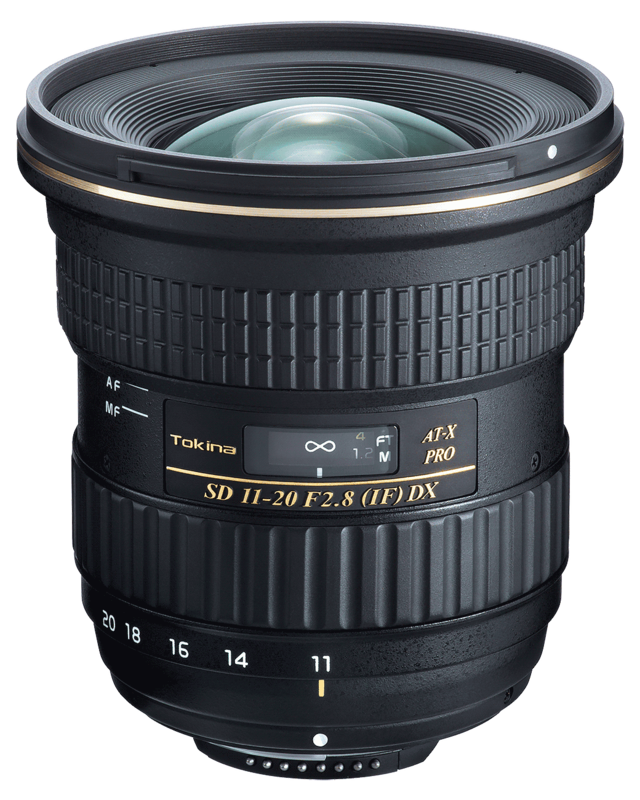 The Tokina AT-X 14-20 F2 PRO DX is a wide-angle zoom lens with super-fast f/2 aperture. The lens is designed for use with either Canon or Nikon DSLR cameras with APS-C sensors. Tokina adds its fastest lens to date to its family of fast-aperture wide-angle zooms focused on providing photographers professional quality optics and construction at an affordable price. The extremely fast f/2 aperture lens offers an equivalent 21-30mm zoom range. The super-bright, constant f/2.0 aperture makes viewing, auto focus and shooting possible in very low light situations while still maintaining reasonable size and weight. The 14-20mm has an all-new proprietary optical design that uses three aspherical lens elements (2 all-glass molded and 1 P-MO lens). This combination achieves superior contrast and sharpness, and corrects for spherical aberrations. Additionally, Tokina uses four SD glass elements (Super-low Dispersion: FK01 and FK03) to control chromatic aberrations, distortion and astigmatism. Two of the elements are SD glass molded aspherical lenses.